The DRY12's main function is to modularly attach to theApeks DRY100 & Apeks DRY75. 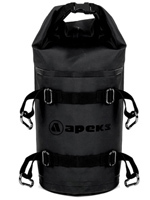 The DRY75 has four locations to attach multiple DRY12 bags. This increases your DRY75's packing capacity by 48 litres. It also provides four added dry compartments to your bag.